For the latest hunting information, we often consult with family friend, Harry Heron. 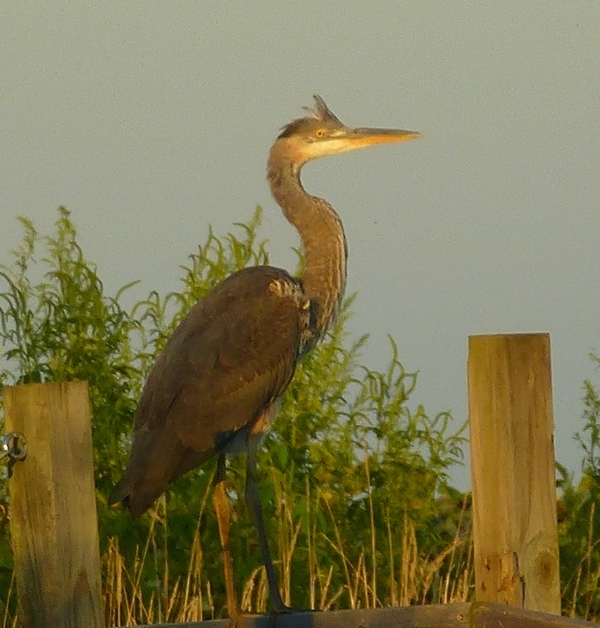 Harry, the semi-psychic water-dousing Great Blue Heron is equally adept at weather forecasts, stock reports, and up-to-date fishing information. Harry's 6.5 foot wingspan is impressive, regardless of his mysterious semi-psychic abilities. 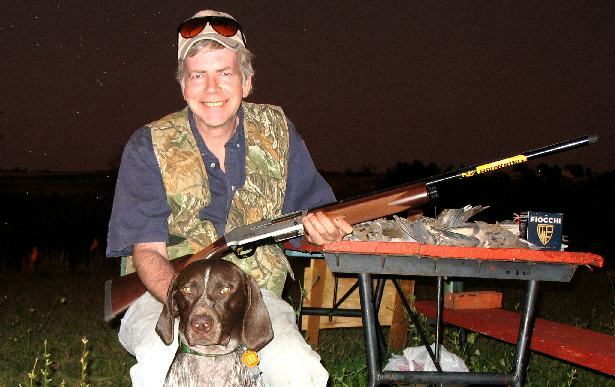 Yesterday marked my first 50 consecutive years of dove hunting. Fifty years ago, at four years of age, I was out dove hunting with my father. Yesterday, I did the same. It has been a lot of hulls, guns, and doves along the way. Initially, it was with a Mossberg .410 bolt action complete with C-Lect choke. Although I was indeed dove hunting at four years of age and made the gun go bang, I can't say I actually hit anything. That gun was of necessity, not choice, and was a lot bigger than I was at the time. It was the opposite of good gun fit. I carried it out to the dove field, but my Dad carried it back to the truck "every night" as he likes to remind me. A short while later, I had a Crescent .410 SxS with double triggers and a cut down stock. That fit well enough that I could actually hit something, not only dove, but my first pheasants as well. A low-end, low-quality gun, nevertheless you can't put a price on memories and experiences. My favorite 28 gauge to this day is a Remington 11-48. My Mom hunted with it before five kids came along, blissfully relieving her of hunting responsibilities. It is still a wonderful little gun today, doing a fine job within range. My sister had a great time using it, as did my sister-in-law, along with some early girlfriends. A fun gun, but with the caveat "within range." On a good year, the better long range load doesn't matter. Fifteen birds is the limit here, and if you skip the longer shots and it takes you a bit longer to bag your limit, that's a big hot steaming pile of "So What?" No question that effectiveness is payload-related. 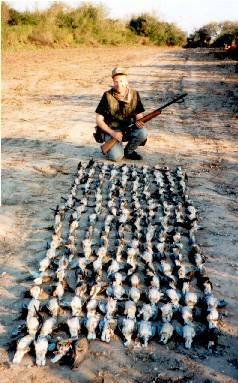 The late Bob Brister, for example, was a proponent of jump-shooting doves with 1-1/4 oz. loads. When heading to Argentina, the local loads available were dirty 7/8 oz. 20 gauge loads or 1-1/8 oz. locally loaded Fiocchi 12 gauge loads. I brought a pair of B-80 12 gauges, "Boy Scouts Motto" and all that, though only one was ever used. A better load for doves, to be sure, but also for paloma grande, teal, perdiz, Rosy Bills . . . as this wasn't exclusively a dove hunt. Bob Brister was in no way wrong, the classic 1-1/4 oz. #6 shot pigeon load was and is a fabulous dove load and one I used quite a bit when pigeons and crows were at the "high pest levels" here in Illinois, no longer the case. I'm hardly allergic to 12 gauges; it isn't like I don't have a goodly number ready to hunt. Last year I dropped quite a few doves with my favorite longer range dove load, 1-1/8 oz. of hard American #7 pushed by Green Dot out of my Vinci. I have no more interest in hunting with a 12 gauge with a 7/8 oz. load than I do in driving an eight-cylinder car with a couple of plug wires pulled off. So, for quite a while now I have been using 1 oz. high-antimony #7-1/2 loads out of a 20 gauge as an effective, appropriate, soft-shooting, and extremely fun balance for Illinois dove. Make a packet out of foil large enough to hold all of the ingredients. Add the ingredients to the packet and seal. Gently shake packet to distribute and mix ingredients. Cook over medium heat 20 - 30 minutes or until done turning several times. In a small skillet, cook the dove and garlic together in a little olive oil until brown. Remove and drain. In a sauce pan, combine the cooked dove with the rest of the ingredients. Stir together. Bring to a boil, reduce heat to a simmer and cook 10  15 minutes. Mix mushroom soup, milk/cream, mushrooms, rice, garlic salt and celery salt in large casserole dish. Arrange dove breasts over the top of the mixture. Sprinkle onion soup over the top. Cover and bake at 350 degrees for 1 hour. Uncover, sprinkle with cheese, and continue baking for approximately 20 minutes or until cheese is melted.